"If one devoted themselves to the joys of statistics, "grace" and "poetry" would undoubtedly be recurring words in critiques that mention Liu Fang's art. "Touching", "dazzling" and "subtle" would also figure well..." - Ouest France, mardi, 1 août 2006. “… Lyrical themes are embellished with silences and majestic tonal nuances. … the music of Chinese Liu Fang, virtuoso of the pipa, ..., seems to emerge from the soul with thrilling and total clarity. ” - GEO magazine (France), 2006. “… Thus the “pipa”, which the young Chinese virtuoso Liu Fang plays with an surreal grace, … and the zither “guzheng", the other traditional instrument she plays, both emanate the same intangible sensations, and the same subtleness of evocation. …” - Les Inrockuptibles (Music magazine for World, Jazz, and Songs), France, 2006. "... delicate yet sensational, ... without any amplification, Liu Fang presented a concert of nearly two hours playing Chinese lute pipa and guzheng (a kind of zither) ... a fascinating experience. With Liu Fang, a great ambassadress of Chinese music has come..." - Ton Maas, de Volkskrant, Amsterdam, the Netherland, 29.03.2005. "... With the wind in her hair and eyes closed, Liu was the picture of composure and elegance. ...". - Graham Bond Critics, WOMAD 2004, Reading, UK, July 25, 2004. "Yes, there was just one musician, but ten talented fingers!". - Sir Ian McKellen at the BBC concert, November 7, 2003. "... Masterful, graceful and riveting, ..." BBC London, November 8, 2003. “Technique, a mastery of the movements, and agility, her fingers moving at an incredible speed. The audience was enchanted, captivated by this splendid sound. 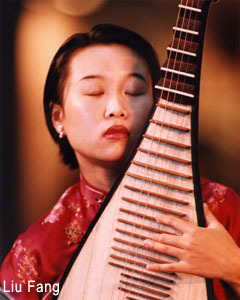 While playing, Liu Fang becomes one with her instrument. … Liu Fang is an exceptional musician; she represents the charm, the grace, and all the magic of the East. She plays with such an ease that one forgets the difficulties of her art and is transported into her world …. " - Olonne-sur-Mer, le journal Ouest-France, 11 decembre 2004. "The ambassadress of charm … The listeners… were listening in a religious silence inspired by this artist, who approaches interpretation like a sacred act…One is literally transported in the serene exoticism of the landscapes that emerge from music that is just as “figurative” as the titles of the pieces would imply....With a winged grace and extreme refinement,….Liu Fang draws out pure songs of subtle nuances from her instrument. … " - VENDEE MATIN, vendredi 30 avril 2004. “…an evening of all grace, poetry, delight and delicacy. … Delicacy: the word summarizes Liu Fang’s art. A delicacy in the smoothness of her execution, employing the softness of the traditional melodies to communicate inner emotion…. On the four strings of the pipa, a kind of pear-shaped lute, her fingers run, fly, and dance. Her expression, either open-eyed by the warlike drama or eyes closed by inner emotion, accompanies the notes which pour out ambitiously. One does not need to be an expert on Oriental history to appreciate this exceptional concert. …” - Le Progres (France), 20 novembre 2003. “…her music, performed here solo, makes us experience a range of emotions, from naive amazement to warlike violence, from introspective meditation to the floating dreaminess, from extreme delicacy to energetic impulse. The emotion always flows masterfully. …” . - Yves Bernard, ICI (Montréal), 2002. "... But there can be no overlooking the spectacular instrumental closer that just burns down the house. Liu Fang on pipa & Farhan Sabbagh on mazhar, an open framed drum, take off on a supercharged dance blast called "Night of the Bonfire" that will burn the soles straight off your shoes. ..." by Barbara Flaska, PopMatters Music Editor,, 11 February 2004 . "... This glorious music is represented here by many artists. Particularly touching is the soft "The Night of Bonfire," performed on the pipa (picked dulcimer) by Liu Fang, currently a resident of Canada. Performed with a wisp of percussion by Farhan Sabbagh, the delicate song races forward to a breakneck tempo by mid-song. Not bad for an artist in her 20s! ..." Rough Guide to the Music of China, World Music Network, 2003 . "Liu Fang is one of the most renown pipa players outside of China. ... She possesses virtuoso technique, grace and a unique empathy toward the music she plays -- whether it is a traditional folk tune or a modern Western composition. ..." - François Couture, All Music Guide, 2003. "MUSIC - The sound of silence: Spaces between the notes matter to virtuoso Liu Fang. ... 'Behind every note, there is soul.' During her interview with The Gazette, Liu proved the point most eloquently when she removed her plpa from her case and began to play..." - BERNARD PERUSSE, The Gazette (Montreal), Tuesday, March 26, 2002. "... a veritable feast of alluring sounds, ranging from the eloquent and lyrical to the flamboyant and percussive. The varied soundscape produced by one player and one instrument is quite dazzling. Liu Fang’s masterly technique (e.g. tremolo, delicate harmonics, lyrical tunes, and boisterous percussive effects), as well as the music itself - which is based on short sections characterized by ever-changing tempos and dynamics - all evoke an improvised and exciting quality. ... "
- The Wholenote Magazine, April 3, 2003. - Dr. Lucie Rault: Traditional Chinese Music, Actes Sud/Cité de la Musique, 2000, Paris, France. "... The musicians ... and Liu Fang on pipa are all superb players. ... Liu Fang's lyrical and military styles, exquisite in the speed and evenness of her finger rolls (something like flamenco guitar, but infinitely more delicate), ... created an unusual concert experience ..." - Stephen Petersen, Arts reporter, The Chronicle-Herald, Halifax, Nova Scotia, Canada, Monday, July 8, 2002, Volume 54, No. 160. "... Liu Fang is without question the greatest ambassadress of the art of the pipa in America and Europe ..."
"The empress of pipa - Montreal counts one of the greatest virtuosos of pipa, Liu Fang. ..." -Pierre Cayouette, in L'actualité, 15 décembre 2001, p90. "... She shift nimbly from sparse passages that allow the pipa's sharp tones to blossom and breathe, to blistering runs that, in their density, would make flamenco masters weep ...", -Rupert Bottenberg, Mirror, Montreal, March 21, 2002. "... The pipa entered alone after a silence, with a pungent clash of chords, ... and made way for an intimate music of real lyric beauty. ... Soloist Liu Fang played with the intensity and timing of a great actor delivering a reflective monologue. ...", - Muisc where East meets West by Robert Everett-Green, The Globe and Mail, Friday, March 8, 2002. "The pipa, the lute emblematic of Chinese music but possibly of Persian origin, has now one of its ablest interpreters in the person of Liu Fang. Having lived in Germany, she is now at home in Canada and on passing through Paris will be offering us an hour of pleasure. Lucie Rault, a researcher and sinologist at the Musée de l'Homme, kindly drew our attention to this virtuoso, who in playing becomes the very soul of her instrument and whose technical prowess has listeners melt into the music. The lightness and pliancy of the notes draw us into the compositions, transforming us into jasmine blossom or silver trinkets tinkling outside a temple in the passing breeze..."
"Much has already been said about Liu Fang's sublime musicality and the exquisite nimbleness of her masterful fingers. What springs to mind foremost, however, is her unusually intimate relationship with her first instrument, the pipa. She seems to have arrived at a tacit understanding with the pipa so that the music plays itself out from this union as does a pure drama project itself through an actor -- so completely that the player is fully consumed by the art. Liu Fang's music is indeed the soul of its drama, from the crescendos that rise to great heights to the most delicately laced melodic notes. In true affirmation of her power to be one with her instrument, Liu Fang enters the world of the guzheng so very profoundly as to play her music as if emerging from the earth itself." "...Liu Fang becomes one with her instrument, sometimes with a most delicate grace, sometimes with a surprising power, evoking feelings of both meditation and frenzy from the audience. The musician possesses an extraordinary finger technique and dexterity which frequently astonished the public and raised admiration from the listeners. If Samson's power lay in his hair, that of Liu Fang is indisputably in her fingers!" "... The pipa is a traditional Chinese string instrument, four-stringed, pear-shaped and resembling a lute, although there is more space between the frets and fretboard to allow the player to apply perpendicular pressure to the string for microtonal effects, something typical of Far-Eastern string instruments. It gives it that special Oriental “twang." Otherwise it sounds much like a lute with something of the banjo's dryness and finger-picking technique (but not that metallic). Liu chose her program from the authentic traditional and “modern traditional" repertoires. The disc begins with Hua Yan-jun's “The Great Wave Washes the Beach," one of the classic pipa compositions of the 20th Century, a gracious, evocative tune. But the highlights are found in Zhen Qi-ren's “Melody from a Bamboo House" and Wei Zhong-le's “The Moon Is High." The first one is a contemporary piece that, despite its respect for musical tradition, takes matters deeper into complexity and originality. In Liu's interpretation we hear her complementary interests in traditional and innovative musics. The second is at least a millennium old and calls for wide amounts of virtuosity through its 13 minutes of duration. The way the basic themes are ornamented seem to reflect the structure of nature or -- as it would be called much later - fractal geometry, producing endless fascination. Out of Liu's fingers ooze serenity, precision and beauty. Highly recommended. - François Couture, All Music Guide. "Liu Fang is a remarkable virtuoso of the pipa, a Chinese lute. She plays with a grace that captures the soul of the Pipa possessing such profound presence that she becomes one with the instrument. Amongst her many international concerts as a featured classical soloist is a command performance for the Queen at the age of eleven. With a consistent technical prowess and range of unimaginable dynamics, she can take you from a visceral frenzy to a deep breath of silence that cleanses the spirit. An extraordinary player as well, of the Guzheng, a Chinese zither, Liu Fang mesmerizes you with her delicate fingers that appear to prance, playing with an ease that is undoubtedly a result of years of intense training and keen discipline. This artist continues to astound and bewilder her public. Liu Fang's playing is an inspirational experience not to be missed!" - Janet Lumb, artistic director, Montreal Asian Heritage Festival. "What can be said of Liu Fang's pipa and guzheng recital in Paris? A veritable feast for the ears, eyes, heart and soul for the attentive, appreciative audience. With such an accomplished musician, technical difficulties are forgotten to pass effortlessly and serenely into a marvelous musical paradise....Liu Fang's outstanding technique is married to her musicality. She performs master pieces of the Chinese music with not only her fingers but also her heart and graceful figure. She melts into the music. She excels on the pipa but is also wonderful on the guzheng..."
Scraping and gripping the cords with her five fingers, the Montréalaise of Chinese origin produced effects that passes from air to frenzy. Particularly in the part "Ambush", describing the battle around 200 years before Jesus-Christ, she has astonished listeners with effects that seem to be invented in some modern pieces. Liu Fang’s performance of the traditional pieces may have even chocked some rock'n'roll guitarists by its force, rapidity and effects. The sound landscapes followed one another, making live the phases of confrontation until the last passage which could have been written by a composer of modern music. "The first time I saw Fang perform, I was amazed at her discipline and her level of virtuosity on the pipa and guzheng. ..."
- Dugg Simpson, Artistic director, Vancouver Folk Music Festival, 1999. "Liu Fang's Passionate Pipa - Traditional Chinese Music is in Her Heart and Soul": interview by Paula E. Kirman of the "Inside tWorld Music", June 24, 2001. "... the pipa (kind of lute) of the young Liu Fang, with the very expressive style... " - Nora Ben Saadoune, The Press, Montreal, Wednesday April 7, 1999. "Liu Fang captures the soul of the pipa, a Chinese lute, ... for her delicate and spirited virtuosity." "... Liu Fang's playing is notable for its well-articulated dynamics and inspiring lyricism..."
- Les classiques du Monde, Musique-Multi-Montréal, March 28, 1999. "... pipa princess Liu Fang ..."
Acknowledgement: Entries marked with are translated from the original French texts into English by Rebecca Lessard.